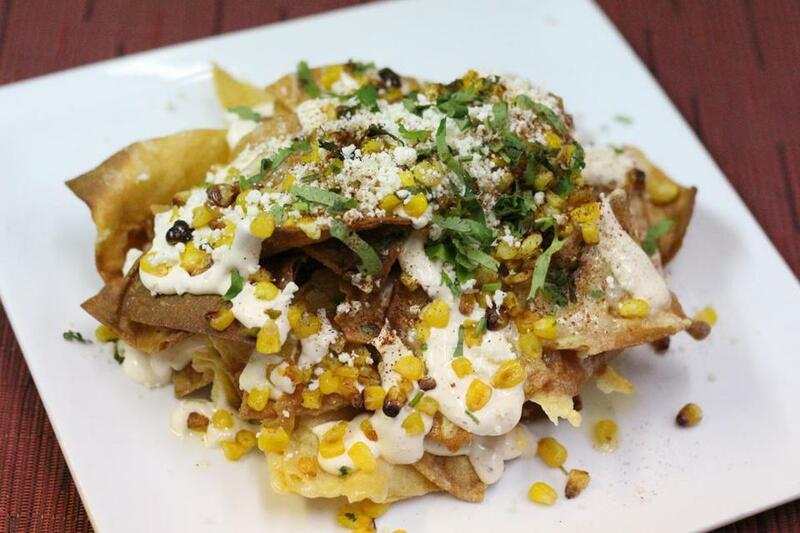 Sweet corn nachos at Bourbon’s Kitchen & Cocktails in Framingham. The Locale Understated is an understatement. When you enter the parking lot, you could be forgiven for thinking you’ve arrived at a bank in a strip mall. But don’t be fooled by outward appearances. This is a popular restaurant for good reason. The bar is tastefully decorated in subdued, wood tones. A small lounge area with low seats and small tables is positioned beside a more traditional dining room. Although the restaurant has a combined seating capacity of 98, and another 22 at the bar, it fills quickly on opening. Be prepared to wait if you are here on a Friday or Saturday night. The wait is less on weeknights and Sundays. Bourbon’s does not take reservations. On the Menu First, the drinks. Although a full beer and wine menu is available, it’s the craft cocktails that Bourbon’s is known for. The house speciality is probably the Bourbon Smash. It’s a combination of bourbon, sweet fresh lemon, a simple house syrup, and mint. “Almost a lemonade like drink,” Foley explained. The Cherry in the Rye is a homemade syrup and American rye whiskey poured over an extra-large ice cube and topped with a Luxardo Maraschino cherry. The menu is heavy with appetizers. Bourbon’s had 17 on the weekend I visited. This is to encourage conversation and sharing. They’re under the heading “Shareables.” The Meatballs ($10) were served in a classic marinara with shaved parmesan. The Little Devils ($8) were eight bacon-wrapped prunes, stuffed with gorgonzola and accompanied by a Dijon dip. This was super-rich but delicious. The Nachos ($10) are more interesting than they seem, and feature grilled street corn with pepper jack, jalapeños, and cilantro. Odd as it may seem, the Buffalo Cauliflower ($8) and Crispy Brussels ($8) are the most popular appetizers. The first substitutes the veggie for chicken wings, and the latter is topped with a truffle-aioli sauce and parmesan cheese. “It’s out of control how much cauliflower and brussels sprouts we’re selling,” Foley said. On the entree list, look for classic Italian, Spanish, and Portuguese-infused comfort foods. The list includes house made Gnocchi ($18), which has a wild mushroom truffle cream sauce, and the specialty of the house, Scallops & Chorizo ($24), served over a bed of risotto with roasted tomatoes and scallions. “The 400” Pizza starts at $12 for the classic cheese; toppings ($1 to $4) run from the traditional pepperoni and sausage to pork belly and candied bacon. Mary MacDonald can be reached at marymacdonald3@aol.com.